Posted 02.06.2016 by Fascinating Rhythm & filed under Competition. Harrogate – Spring Bank Holiday, 30th May 2016 and the last day of the British Association of Barbershop Singers annual convention saw the inauguration of the very first Mixed Chorus class. 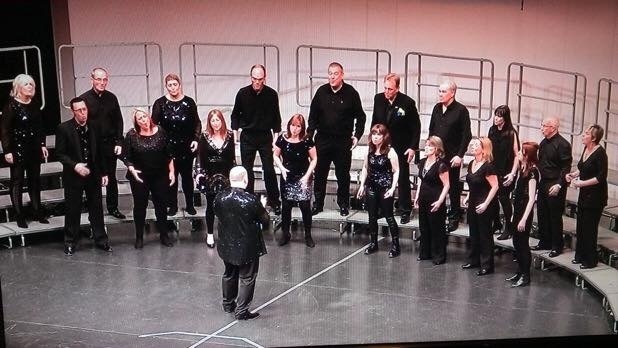 Very proud to report that no less than six of the 24 singers in the group were from Fascinating Rhythm, including our two gold medallists – Ali Jack and MD Jo Dean – with Chloe Roberts, Hanna Davies, Emma Richardson, Brenda Roberts and Julie Morgan. Other members of P24 came from The Brit Pack, Black Sheep Chorus, The Great Western Chorus, Jigsaw Quartet and a special guest from Zero 8! There’s something rather marvellous about this combining of voices from different choruses which also fielded 3 sets of couples. Harmony indeed. Overcoming the almost impossible job of getting tight diaries lined up, the group had just five rehearsals to pull it all together, with only a full number at the last rehearsal. The songs offered were ’My Foolish Heart’ and ‘Undecided Medley’ which saw them romp into 3rd place, with a Highly Commended.